Well the pace has slowed a bit here while many lodges take a couple months off from Stated Communications. Remember that while your Lodge is dark, the Master, Treasurer and Secretary are charged with keeping the Lodge business affairs current. If your Lodge By-laws require a vote of the Lodge for all bills and your Lodge is dark during some point of the year it may be time to consider revising your By-laws so that an approved motion to go dark AND have the Master, Treasurer and Secretary conduct the business affairs of the Lodge is all that’s needed. Grand Lodge has paid the Blanket Liability Insurance Policy for the year so new statements will be sent to all Lodges shortly for your Lodge share of that Liability policy. In addition, your premium for building coverage will also be billed if you have that coverage through Auburn Insurance. If you have any questions regarding insurance, please do not hesitate to contact us here at the Grand Lodge Office. We may not know the answer but we can connect with people who do. The Proceedings of the Annual Communication is coming along. We have finished a draft which will be proof read and edited. The annual audit is nearly complete by the auditing firm so all the pieces will come together soon and it will be printed and sent to your lodges. I know you can hardly wait. Next Monday, July 11, 2016 there will be a Special Communication of the Grand Lodge at Kenduskeag Lodge No. 137 in Kenduskeag celebrating the 150th Anniversary of that Lodge. A ham dinner will be served commencing at 6:30 PM and the Entered Apprentice Degree will be conferred commencing at 7:30 PM as they did on this date 150 years ago upon receiving their Charter. If you would like to join in, please contact the Grand Lodge Office by Thursday, July 7th by the end of the day so we may provide a count to the Lodge for dinner. 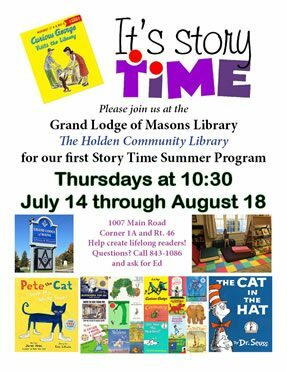 Every Thursday from July 14th through August 18th the Grand Lodge Library will be hosting a Children’s Story Time at 10:30 AM. The flyer with more information is below. Also on July 23rd at 10:30 AM the Thomaston Historical Society will host the General Henry Knox Annual Wreath Laying Memorial Service and Gravesite Restoration Dedication at the Village Cemetery in Thomaston. Be sure to check out the Calendar on the Grand Lodge website and encourage your Brethren to do the same. There is a lot going on in July from dinners where you can eat burgers & dogs, spaghetti, turkey, lobsters or clams, to Woodchopper degrees and parades to march in.